The free Monthly Bank Reconciliation is the best tool for paying back balancing your bank accounts in the most effective manner possible. The free template is a single page and you only need to enter a few key pieces of information in order to use the document. The benefit of using this sheet is having the most effective path to manage your bank accounts, exactly the way you want. The Bank Reconciliation is fast and free and waiting for you to get started. If you’re interested in balancing your accounts more effectively, just continue reading the free guide below for more details. To start, you will need to download the free document by following the link provided below. The next step will be to enter the correct dates and amounts that you owe to the bank. Simply enter the month you received your loan and the last available balance that you owe in the corresponding fields at the top of the Bank Reconciliation sheet. In the tables below, you will see fields for your deposits and withdrawals. Start by entering these transactions as they come. When you make a deposit, you will enter that in the orange box at the top. You can simply list the deposit number, date, amount, description, and if the amount has been reconciled/balanced. You will do the same for the red withdrawals box as well. The template will take this information and give you the calculated amounts in relation to your balance at the bottom of each table. 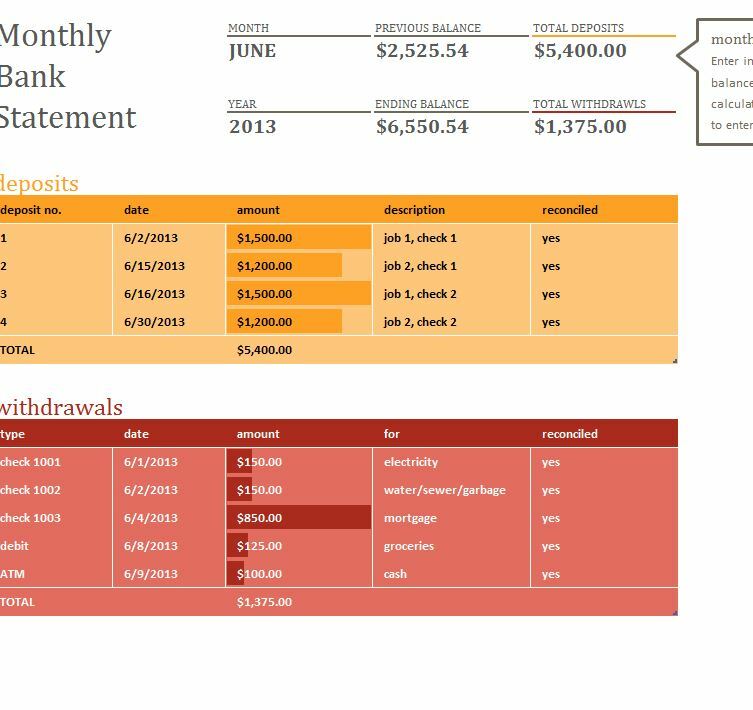 When you are ready to review your bank statement, just scroll back to the top of the page and view the calculated amounts for your totals deposits and total withdrawals. Your deposits should always be greater than your withdrawals. You can finally keep track of all your bank transactions on your own terms.